Derma Klear® Akne Treatment Soap / 3 oz. bar - Nature's Way®. Clears up acne blemishes and allows skin to heal. Helps keep skin clear of new acne pimples. Penetrates pores to control acne blemishes, whiteheads and blackheads. Contains no Benzoyl Peroxide, which can dry the skin. Apply soap to hands or wash cloth. Gently wash affected areas one to three times daily. Leave on skin for several minutes, then rinse and pat dry. If bothersome drying or peeling occurs, reduce application to once a day or every other day. •do not get into eyes. •dryness or irritation of the skin may increase if other topical acne medications are used at the same time or immediately following use of this product. If this occurs, only one medication should be used unless directed by a doctor. Do not use on: •broken skin. •large areas of skin. How does dermaklear® acne treatment soap work? dermaklear® acne treatment soap penetrates the pores to control acne blemishes, whiteheads, and blackheads allowing the skin to clear up and prevents the development of new blemishes. 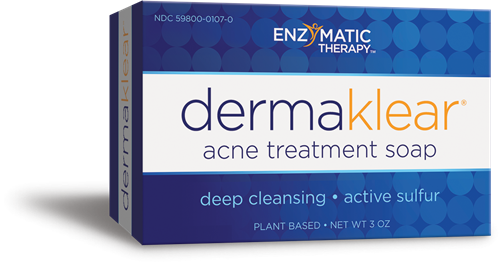 dermaklear® acne treatment soap contains no benzoyl peroxide, so it will not dry out the skin. Can dermaklear® acne treatment soap prevent acne breakouts? Yes. dermaklear® acne treatment soap can be used to reduce the frequency and severity of acne breakouts. dermaklear® acne treatment soap penetrates the pores to control acne blemishes, whiteheads and blackheads; helping to prevent new acne blemishes from forming. aloe vera leaf, alpha-bisabolol, chamomile flower extract, fo-ti root extract, glycerin (vegetable), hawthorn berry extract, pentasodium pentetate, rosemary leaf extract, sage aerial part extract, sodium chloride, sodium cocoate (coconut), sodium palmate, tetrasodium etidronate, water. Complete multivitamin and multimineral specially formulated for the active teen lifestyle.